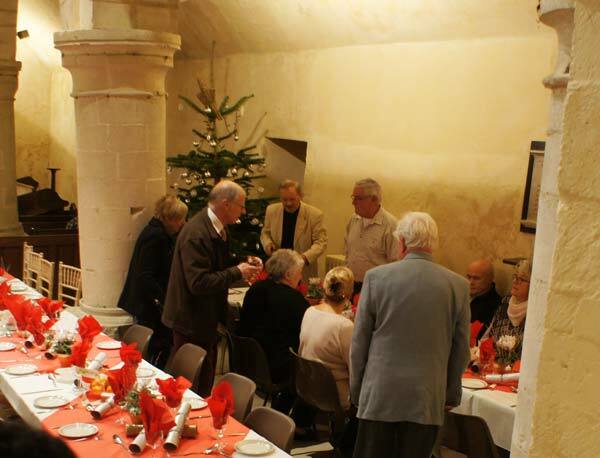 As the Village Hall is now permanently closed to the public and awaiting the developers, the Organising Committee took the brave decision to hold the 2015 Over 60's Christmas Dinner in All Saints Church, with the kind permission of the Rev. Tony Pears. 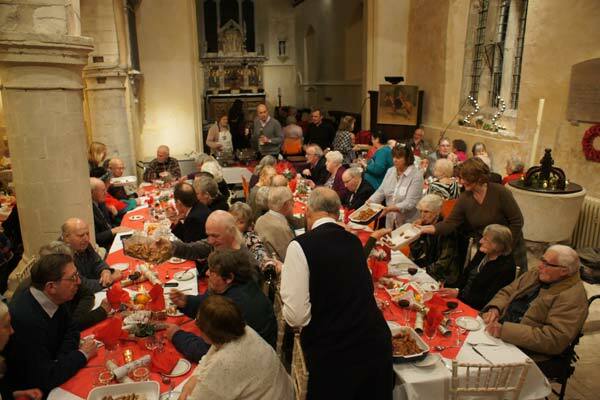 With no kitchen facilities available, holding the event in the Farringdon Parish Church was obviously going to pose logistical problems. 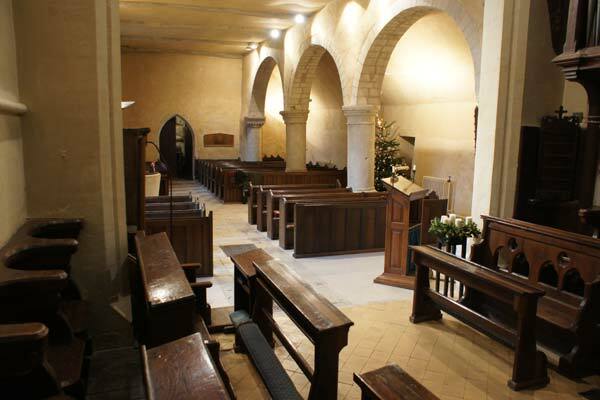 Fortunately, when the building was refurbished in 2001, the then Vicar, the Rev Tony Jardine, had the foresight to suggest that the front rows of pews should be made removable to create a clear space between the font and the choir stalls, an option that has never been made use of until this event. 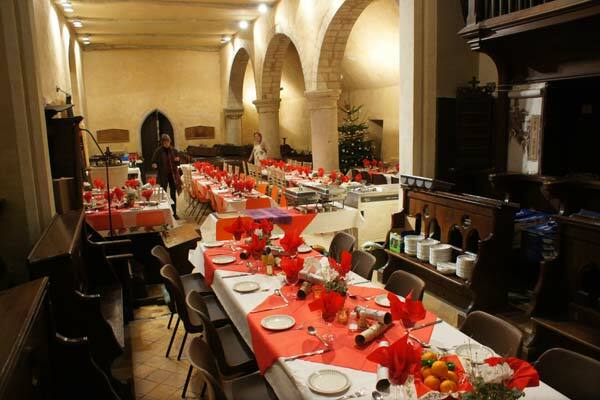 Producing a Traditional Christmas Dinner in the Church, was going to be difficult. 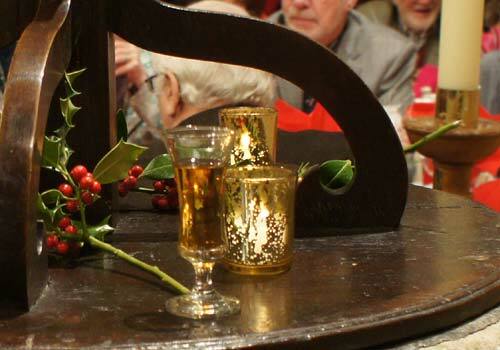 To produce a Traditional Christmas Dinner of the highest quality, which the diners have come to appreciate over the years was going to be almost impossible. The solution, a radical revision of the menu, hire in all the crockery and cutlery from a company whose service includes washing up the dirty dishes, add a lot of hard work and the result? 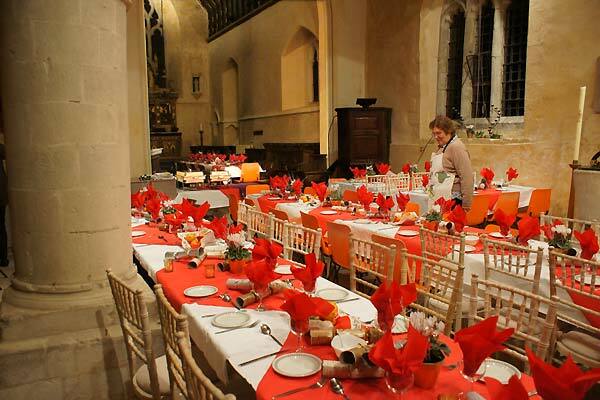 Well the pictures below speak for themselves, for once the 'Biz' photographer arrived in time* to capture these images of the tables laid out and set up for the diners. *Some uncharitable persons have suggested this unusually prompt arrival may have been due to the fact that there would be free food and drink available, a suggestion strongly disputed by your photographer. 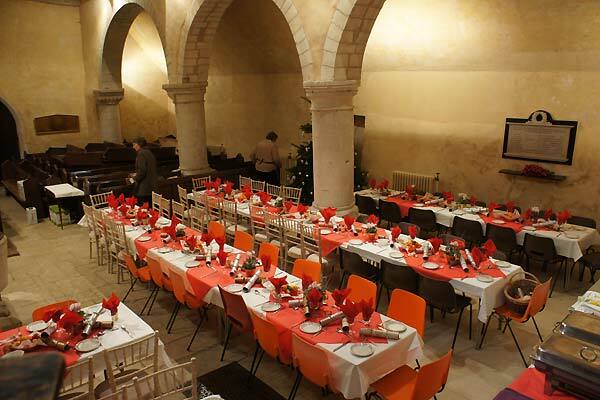 Somehow the organisers had managed to provide seating for 80 diners around beautifully decorated tables and still leave space for those catering department and just enough access for the volunteer waiters and waitresses, although it is fortunate that the current batch of volunteers are of slender build! 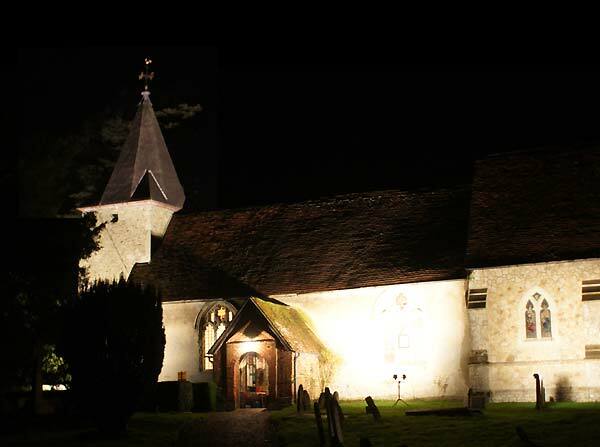 Catherine was casting an experienced eye over the tables when the demand on the Church electrics tripped out the outside lights, but Tim rapidly reset the offending breaker, the problem connection was isolated and full illumination was restored just before the diners began to arrive at the Church Door. 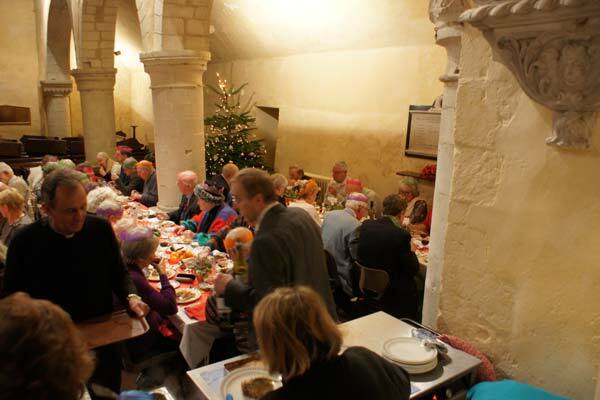 Over the years in the Village Hall, many diners had established a regular spot, so seating took a bit longer than usual in the new venue, although diners were no at risk from bits of the Village Hall ceiling providing unexpected additions to the table decor, or the coiffure of the diners! Presented with the optional glass of sherry on the way in the diners finally settled in their places the waitresses began the distribution of sausages, which obviously caused some amusement on these two tables. 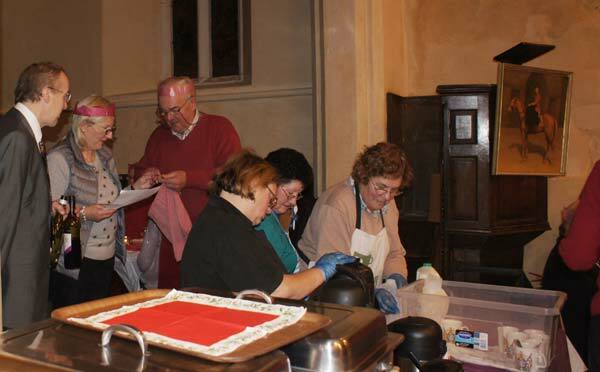 In the background, Lyn and Catherine were in charge of the distribution point armed with heated cabinets, dish warmers and a secret supply route via the vestry. The bangers were swiftly dispatched to all tables and there was a temporary reduction in chat levels as they were consumed by the diners. 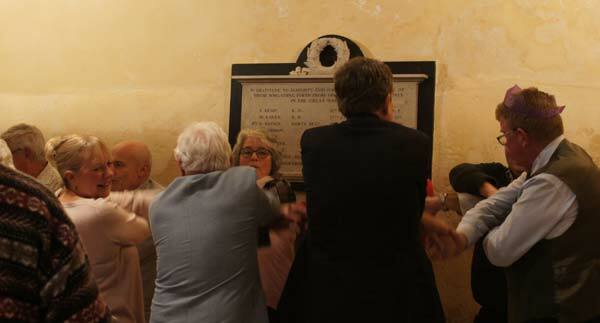 whether this was a position of authority I'm not certain! 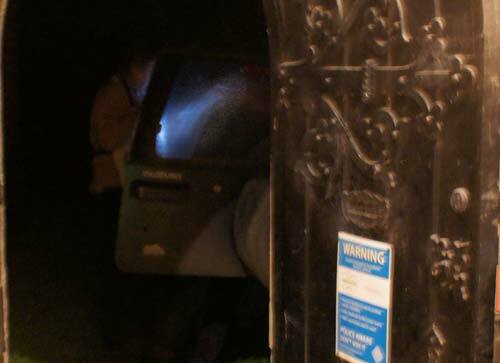 Outside the Vestry door there were strange light shining, nothing suspicious, just torches illuminating the Charrington Catering Transport bringing supplies from the Andrews kitchen at the bottom of the Hill. Those with asbestos fingers rapidly transported the Cottage pie into the cabinets in the serving area and the the main course was ready to serve. The serving team then swung into action in a a well choreographed routine, slightly modified to make allowances for the new venue. 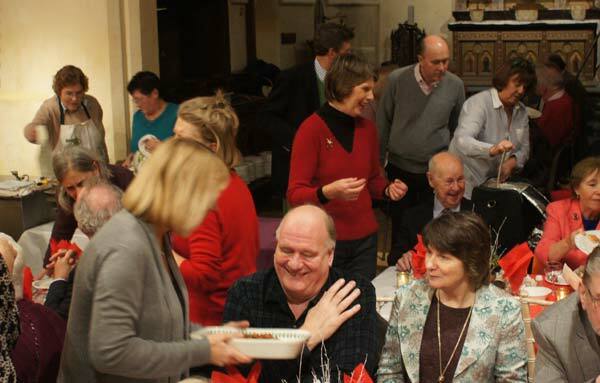 Plates were filled by Penny, Lyn and Catherine and swiftly distributed to the diners while the wine waiters ensured no one was in need of refreshment . 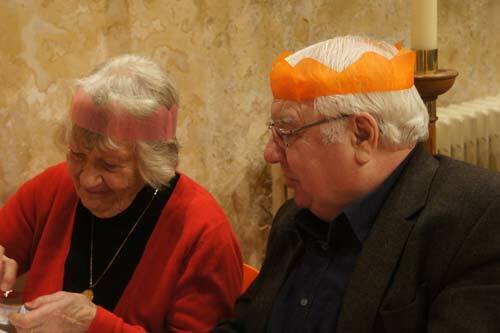 . .
At this point there was an outbreak of cracker pulling with the inevitable result that the diners were soon sporting some very fetching headgear. Gillian and John seen here modelling two particularly fetching examples of the milliner's art. Your photographer took a temporary break to savour the excellent fare on offer, found his wine glass filled to the brim and instantly lowered the tone of the table of those unfortunate enough to have a vacant seat in near proximity. 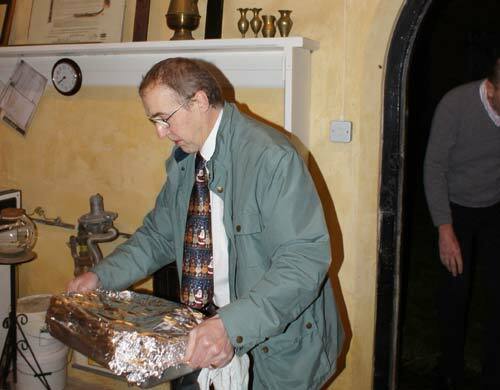 Following the Christmas Pudding it was time for the Maitre d' , Mr Tim Charrington to thank all those who had worked so hard to make the evening as success, to the accompaniment of enthusiastic response from the recipients of the hospitality on offer. 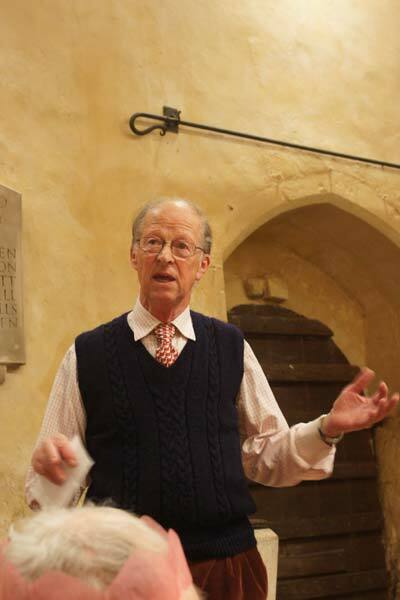 The mention of washing up did, for a brief moment, reduce his audience to silence, only to be followed by a relieved round of applause when it was revealed that the hire of the china, cutlery and glassware included a fee for this task, a feature that was much appreciated by those who used to spend a considerable amount of time at the sink in the Hall Kitchen after previous events. Coffee was then served, again Penny, Lyn & Catherine were in control of distribution from the serving area. 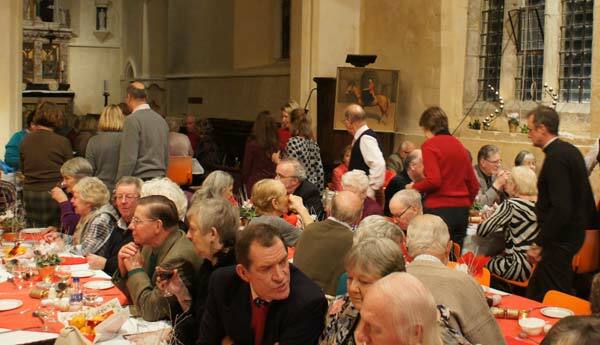 In the background, David and Penny are sorting out the Christmas draw of the Village Hundred Club under the watchful eye of the Sommelier. Shortly after this picture was taken Penny discovered she was one of the three winners in the December Draw. 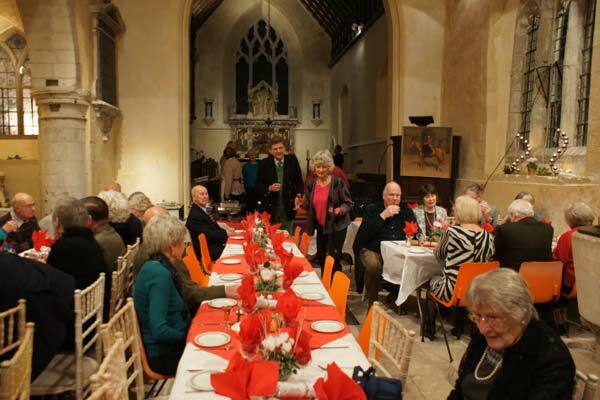 You may have noticed that the Silver Jubilee portrait of Her Majesty Queen on display, brought out of the Vestry for this auspicious event in the Village Social Calendar. 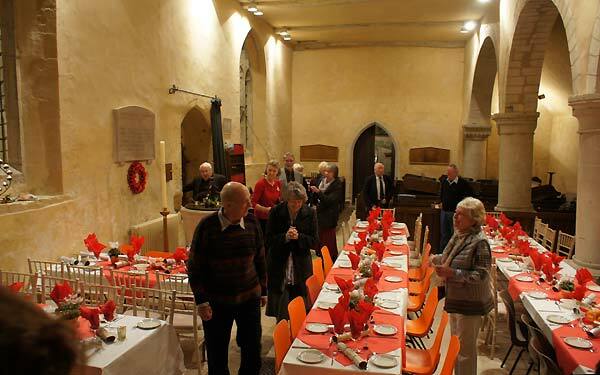 After a very enjoyable 44th Farringdon Christmas Dinner the diners made their way into the night and the helpers began to clear the Dining Area. 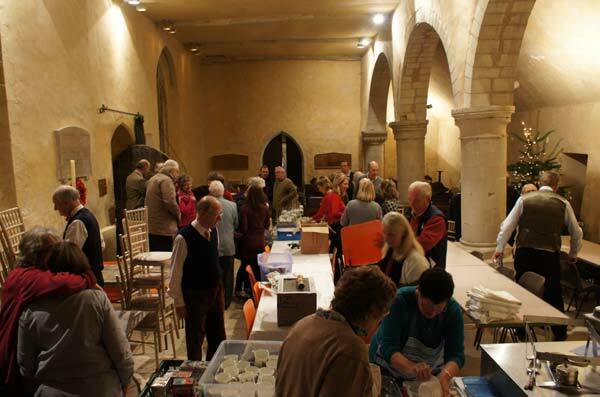 On the following morning a large number of volunteers turned out to clear the church and return the tables and chairs to their storage space. 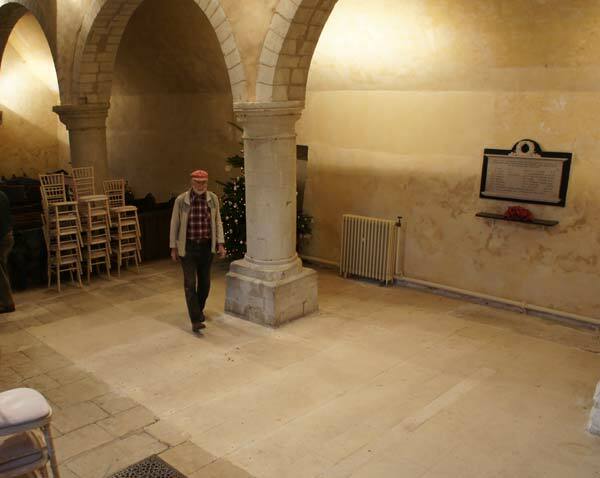 By half past ten, when the picture above was taken , the pews were securely screwed down and the Church was restored to normality so everybody was home in time to watch the launch of the Soyuz spacecraft carrying first official British Astronaut, Major Tim Peake. to the International Space Station. 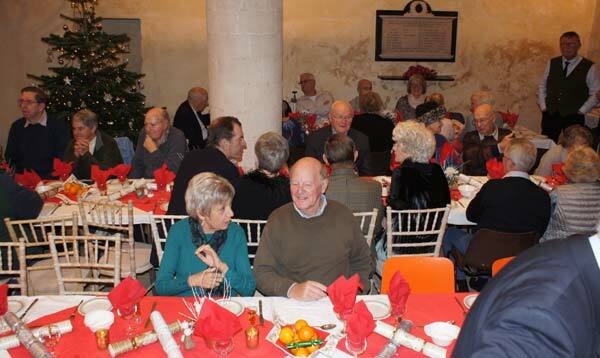 The Organisers and Helpers deserve special congratulations for all the hard work and time involved in planning the 2015 Over 60's Christmas Dinner. 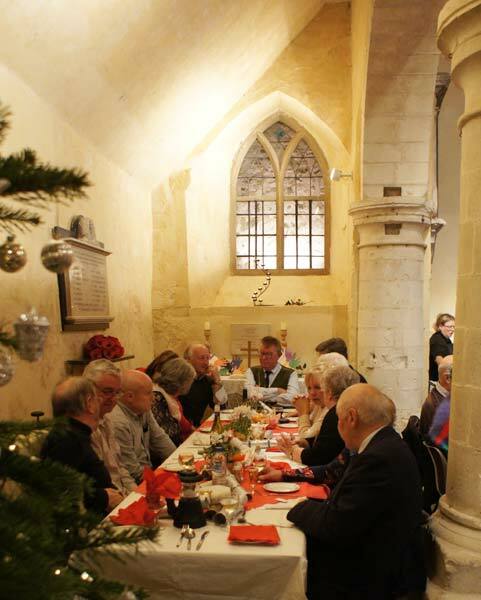 There were many among the Diners and the Committee and I must include your reporter, who were not sure how the non-traditional Menu, would be received or how the problems of serving a meal in the Church with no Kitchen or washing up facilities could be overcome. 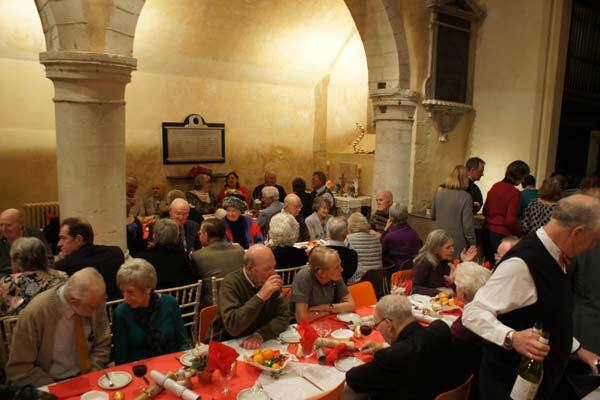 I can honestly say that this has been one of the most successful dinners in recent years, the backdrop of the Church put the crowning glory on an evening that was, without exception, thoroughly enjoyed by all those present and the enthusiastic and genuine reception given by the diners to Tim, the Andrews family and all the volunteers whose efforts contributed to the success of the 2015 Christmas Dinner, was an indication of how much we all (including the immigrant from Selborne!) enjoyed a wonderful evening in a glorious setting.